Steven Landsburg on the odds. Becky Hargrove has a very good post on health care silver linings. The implicit lesson here is that bending the cost curve can be very painful. I'd use the term "death panels," but apparently you can't say that unless you're Paul Krugman. Robert Murphy articulates some thoughts that seem very similar to what I've been thinking about Bitcoin lately. Easy for me to say, though, right? I didn't write anything on Bitcoin, so I can always just point to Murphy's blog and say, "Oh, I was thinking that exact thing before he said it." But, I digress. The point is that I agree with Murphy here. Speaking of Robert Murphy, Daniel Kuehn has some rather unsavory criticism of him. I want to make it clear that I do not endorse Kuehn's position here. I think he's not just wrong, but terribly wrong. And Murphy's admirably graceful reply does a good job of outlining why Kuehn's position is wrong. The only problem is that Murphy was too civil for his comment to really hit home. David Henderson highlights another sad case of media messaging. You can't just read the news anymore, you have to be on constant hyper-vigilance. Solution: do not read the news. Simon Grey reiterates the Tyler Cowen criticism of Nathan Smith's Open Borders piece from a while ago. He should have read Paul Crider's excellent take on the matter, especially since it is the more recent piece. Lubos Motl articulates an argument against philosophy. Or, perhaps more accurately, he articulates his position that philosophy was "proto-science," and later involved into science proper. I don't disagree with him at all, but it is probably worth noting that Motl's point of view here is itself a kind of philosophy. So there is some irony here, but it's one that we can be happy about because, as I said, I don't disagree with Motl here, which is a more cautionary way of saying that I do indeed agree with him quite a bit. A cute, but nerdy, story about an economics class. 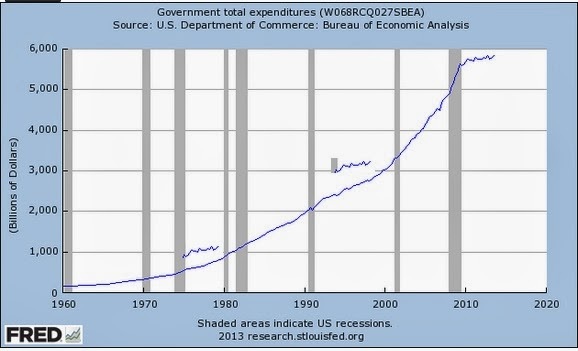 My point is simply this: If we can't even reduce the rate of growth of government spending to mid-90s levels, then our whole view of government spending might be experiencing an existential crisis. Were Clintonian budgets so wrong, by Keynesian standards?